Are These 2 Dark Horse Vaccine Makers Worth the Risk? A new industry report suggests that Novavax and Inovio Pharmaceuticals might be grossly undervalued right now. The vaccine market presently ranks as the fourth most valuable therapeutic area within biopharmaceuticals, according to a new report by EvaluateGroup. However, this high-value market has been historically dominated by big pharmas like GlaxoSmithKline, Merck, and Pfizer, making it next to impossible for investors to get in on the ground floor of a promising clinical-stage vaccine-maker. Compounding matters further, the few publicly traded vaccine specialists available to investors at the moment have been fraught with clinical setbacks and lengthy development delays that have crushed their share prices. That being said, Inovio Pharmaceuticals (NASDAQ:INO) and Novavax (NASDAQ:NVAX) are two pure vaccine plays that might be able to finally break free of this long-term downtrend. These dark horse vaccine makers, after all, are reportedly developing two of the most valuable experimental vaccines in the industry right now. Should investors put their faith in these two underdogs? Let's dig deeper to find out. Over the last five years, Inovio's shares have shed over 80% of their value due to the company's painfully slow pace of development for its lead vaccine candidate, VGX-3100, which is presently in late-stage testing as a treatment for certain forms of HPV infections of the cervix in adult women. And while this experimental DNA vaccine does have the potential to generate substantial sales as the first nonsurgical treatment for precancerous cervical lesions, the company's slow-boat approach to development has resulted in multiple secondary offerings over the years that have dramatically increased the number of outstanding shares. Nevertheless, Inovio does offer a rather juicy value proposition now that VGX-3100 is a little over a year away from generating top-line data. The lowdown is that analysts think that VGX-3100 can generate a healthy $622 million in sales by 2024 -- that is, if it's ultimately approved for its first indication in or around 2020. As biotechs with an FDA-approved product tend to trade at a price-to-sales ratio of at least 3, Inovio's market cap could realistically balloon upward into the $1.8 billion to $2 billion range within the next few years. Put simply, Inovio's upside potential from here appears to be something in the neighborhood of a staggering 450%. Why is the market discounting this stock so deeply? The stark reality is that DNA vaccines like VGX-3100 have performed poorly in late-stage trials, resulting in zero FDA approvals for these third-generation vaccines in humans. Whether VGX-3100 can be the first to break this trend remains to be seen, but the odds are against it. 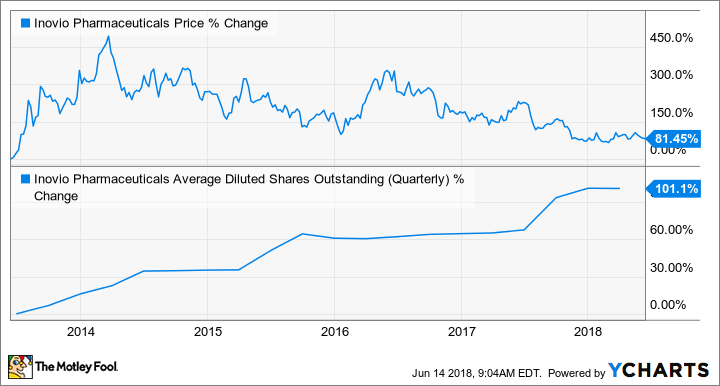 Novavax's shareholders haven't had much to cheer about in quite awhile, but a new report by EvaluateGroup suggests that this situation is about to change soon. This top pharma research firm pegged Novavax's combined respiratory syncytial virus (RSV) and influenza vaccine candidate as the most valuable vaccine in development right now. Specifically, Evaluate's analysts think that the biotech's experimental combination vaccine could generate a stunning $1.82 billion in sales by 2024. That noteworthy estimate easily tops those for other contenders for first place, such as Merck's pneumococcal conjugate vaccine V114, as well as Inovio's VGX-3100. The key takeaway for investors here is that if this rosy outlook comes to fruition, Novavax's shares should turn out to be a downright steal at current levels. This clinical-stage biotech is only valued at around a third of this vaccine's projected sales after all, and Novavax has other vaccines in play that could drive total sales into the $2.6 billion neighborhood within the next five years. Why is the market ignoring these sky-high revenue projections? Apart from the fact that Novavax has been stung by major clinical setbacks in the past, this clinical-stage vaccine-maker currently doesn't have the financial assets necessary to see both of these product candidates through to a commercial launch. In other words, Novavax will eventually have to issue additional shares if it can't ink a licensing deal with a deep-pocketed partner soon. Are these two vaccine stocks worth buying? Although Inovio and Novavax both look like attractive growth stocks based on the sales forecasts for their lead product candidates, my view is that a deeper dive suggests otherwise. The bottom line is that neither of these companies has come close to getting a product into regulatory review, despite being in existence for several decades at this point. Moreover, each company still needs to shore up its long-term financing needs, and that's most likely going to come at the expense of current shareholders.